Before shifting classes, players must find the Class Shifter in one of the main cities(141,-173) and put in a Class Shift application. After some analysis, and feedback from players, it seems that the best time to utilize this function is below Level 100, as those that have surpassed this stage require a special item to be turned in with the application. One other thing to remember is that all equipment(including fashion suits) should be unequipped before shifting. Class: Didn't see that coming, did ya? Spells: Spells specific to the previous class will be sealed and unavailable. While spells specific to the new class will be unsealed and available. If this is your first class shift, make sure you pickup the required spellbooks from NPCs to learn the new spells. Talents: The level of Talents from the previous class will be converted into talent points, unless all talents have reached Level 40, in which case they will remain at 40. 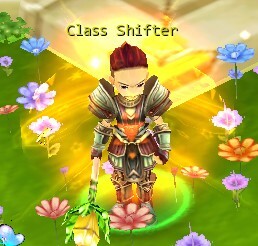 The Class Shifter is also able to help you shift a weapon into the same level weapon specific to another class. Again, those that are over Level 100 require a special item called a Equipment Shift Permit to make equipment shifting possible. If the damage type of the weapon is shifted, the damage bonuses will be adjusted with the help of the Class Shifter as follows: Increasing attack power Lv.1~Lv.5 and increasing spell power Lv.1~Lv.5 can be transformed into each other. Increasing physical damage by % and increasing spell damage by % can be transformed into each other. 1.After being transformed, the weapon will be bound, but its rank and star level will remain unchanged. 2.Weapons that are part of a Class Suit cannot be shifted to another class. 3.The additional attributes of Ring and Helmet (offensive)can be shifted through the relevant NPC, yet the shifting of the main attributes thereof has to involve Amethyst. 4.The Class Shifting will not affect the effectiveness of Holy Stone. From Level 101 on, you can receive a special quest that rewards completion with 2 Class Shift Permits and 6 Equipment Shift Permits.